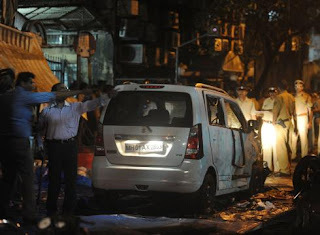 The latest bomblast in Mumbai reminds me the good relations that an overwhelming number of HIndus and Muslim enjoy in India inspite of mischievous elements in the our country. In Jan 1992 we were victims of post Babri Masjid Mumbai riots. We received a call from our neighboring shop keeper Hasu Bhai " Yusuf Bhai (brother) Your shop is completely burnt and there is nothing left.. please dont come here, it is dangerous..." For the next few months we were at home doing nothing. The neighbor who called up to inform us was a Gujrati Jain and a close friend of my father. We received a call from the same neighbor.. He offered money to restructure our shop and the Mafatalal company's MD's P.A. calle dup and told us to restart the business with all help from the company. We did it. In a month the shop was inaugurated. the Gujarati Jain came with his family and relatives bought good worth 50,000 thousand rupees to make us stand back. It was a memorable show of solidarity and I will never forget that. Even today when I visit my father's shop I go to say a hello to my neighbor. During the same riots our second shop, which was situated a couple of miles far from the first shop was also in danger. We feared that it too could meet the same face... The senior inspector of the Police Station... Mr. Doble (if I remember) a higher class Maratha with a great reputation of being non biased and non corrupt, moved around the area in his jeep and chased the crowd away when ever they gathered. Our shop was saved. Again during the Mumbai 92 riots the Indian military caught a high profile politician known for his anti Muslim stance.. and arrested him. they refused to let him free even though he was a big man. Later that man even reached Loksabha .. but the military pursued the case and finally before the man died few years back he was convicted!!!!! You will find many such jewels in the large and deep Indian ocean and that brings us to the conclusion of today's discussion...How many of us remember this fact that after 11 Sept the Americans re elected George Bush in spite of the killings of innocent Afghans and Iraqis.. Next year India had an election and the Indians (over whelming Hindu majority) threw out the BJP government in elections and its allies in most of the states,and the outgoing Prime minister Atal Bihari Vajpayee said we lost because of Gujarat riots.. and he was right..
And I conclude that India is a country of good people and we have 16 thousand +madrasas, pouring out hauffaz and aleem every year in thousands, and even Peace TV is run from India and not from any other 52 +Muslim nations...Right?